Use only iCork Floor’s recommended water-based polyurethane, Loba 2k Supra AT, to seal our cork floors. Not doing so will void warranty. Contact a Forna or iCork Floor agent for questions and concerns. The Loba polyurethane requires a high end, painter’s roller with a low-nap micro-fibre. We do NOT recommend any other applicator. Professionals are welcome to contact their Forna Representative for further instructions. Room temperature:(18 – 23 deg Celsius) and with stable humidity of 35% – 65%. Make sure any HVAC systems are inspected and up and running before, during and after installation of flooring products, as per NWFAC guidelines. Always ensure that the product you are working with has been stored at appropriate temperatures, with no less than 2-3days of acclimation time to the area of install before application. Protect From Freezing: Keep all Loba-Wakol products between 5-28 deg Celsius (42 – 85 F). Products must be stored indoors at appropriate temperatures. Failure to do so will render product unusable. Allow the floor 1-2 hours to dry once the final damp-rinse (water only) has been completed. Allowing the water to evaporate off of a damp floor means the finish has the greatest chance of success. 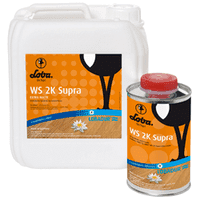 Sanding or Abrading the Factory Finish: Loba 2K Supra AT can be used as the top coats/sealant over the Forna factory finish. To achieve the best results and to maintain warranty, Forna requires the factory finish be LIGHTLY abraded before application of the product. Wipe down the cork using a clean microfiber mop or clothe that is water-damp only. Allow the floor 1-2 hours to dry before applying the polyurethane. Abrading the finish Manually (no machines): Gently sweep a “high grit” sand paper (anything over 100 grit will work) lightly over the floor (like wiping a child’s face) to create micro-abrasions. This light abrasion should NOT change the appearance of the factory finish nor the pattern/stain of the cork below. Glue down cork tiles: Allow this type of cork flooring to “set” or cure no less than 24 hours before application of sealant/finish. Floating floor cork floor: Can be finished once the floor is installed, but iCork Floor recommends that the floor should be allowed to “rest” for 1-3 days prior to application of finish. Any installation errors will likely become visible during this resting period. Correct all installation errors BEFORE applying finish. Mixing the Product: Shake both the large container and the small container for 1 minute (60 seconds). Mixing a full gallon (600sf of product) or full 1 Litre (150sf of product) container requires the smaller “hardener” to be poured into the larger “plastic jug” of finish. Shake combined contents for 1 minute (60 seconds). The Loba 2K Supra AT is now ready for use and must be applied inside of 2 hours (120 minutes) after combining the two parts. Mixing Small Batches: To mix “less than a gallon” of product use the “coverage” amount of 550-600sf/gallon as a guide. Once the product has been shaken (in the two separate containers) pour the “Supra”: “Hardener” to a ratio of 10:1. Shake contents of the container for 1 minute (60 seconds). Product is ready to apply. Example of mixing small Batch: 200sf of flooring = 1/3 of 600sf. Mix 1/3 of the large container together with 1/3 of the small container into a mixing tub. Preferred Method of Application: Direct pour the product onto the floor, saturate the roller head and then begin applying product. If you are not familiar with this technique, continue on to the “Painter’s Tray” method. Using a Painter’s Tray: Use only new trays that have been rinsed clean with water and have been allowed to dry. Pour enough polyurethane into the tray to finish the amount of flooring you have (use the “square feet per gallon” as the measure; eg 300sf of space requires ½ gallon of high-end polyurethane) into the painter’s tray. DO NOT “Edge in” too much flooring! This will cause “lap mark” issues. Saturate the entire roller with polyurethane, making sure to squeeze out the “extra”. Your roller should be saturated but not dripping. Moving quickly back to the starting point, immediately begin to roll on the next row. Continue in this way until the floor is completely covered. Resist the urge to “go back over” spots that are older than 10 minutes! If you go over a partially dried area, you will create “Lap marks” that will require sanding before the finishing coat can be applied. Allow the finish to dry thoroughly before applying the next coat. Light use: Stocking feet after 5 hours. After 24 hours – shoes are allowed at this time. First Damp Clean: 14 Days after application of second coat routine maintenance with damp cleaning can begin (water or pH neutral hardwood floor cleaner). NO RUGS, NO FURNITURE, NO PETS are allowed onto the floor until the floor has achieved a full cure. Even if the floor looks cured, it may not be. Err on the side of caution and allow extra time before allowing animals on the finished floor. If you have any questions, please contact your Forna Flooring expert before continuing with your project. During the curing time, only light traffic in stocking feet can access the floor. Water based Polyurethanes have a very short “working edges” of 10 – 15 minutes! If you find you are running into “lap marks” then STOP APPLICATION. You are either working too slow OR YOU ARE WORKING THE POLYURETHANE TO THIN! Contact your Forna Flooring representative while you are waiting for the floor to dry! If your floor looks like it is buckling, separating or “lipping”, DO NOT apply polyurethane. Contact your local Forna representative for advice.